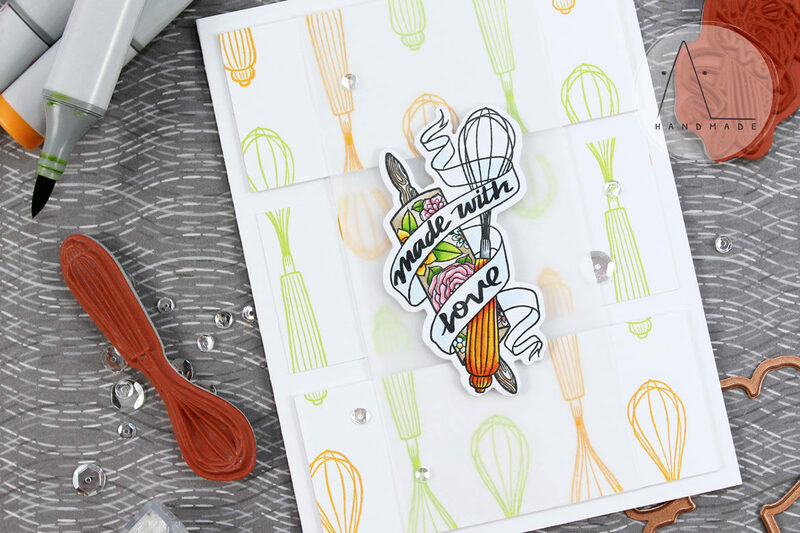 For my first project I used the lovely Kitchen Handmade set: its images are so beautiful and – as you can see – they’re just perfect for creating cards to go with homemade gifts from the kitchen. I started to work on this card by stamping a custom pattern in two colors on a card base, using Distress Oxide Wild Honey and Twisted Citron along with one of the images from the Kitchen Handmade set. Next, I cut the stamped panel in three parts and foam mounted them on a card base to create dimension. I stamped the main image with Memento Tuxedo black ink and colored it with Copics. Once my coloring was complete, I added a bit of Wink of Stella to the banner for shimmer and used the coordinating die to die-cut the colored image. Then, I foam mounted the it onto my card, adding a stripe of vellum behind it. Finally, I added some sparkling clear sequins to embellish my project. My second project highlights the Handcrafted Handmade set and is a colorful example of how small stamps can be the leads of a project. It was so much fun! To create this card I started from the background. 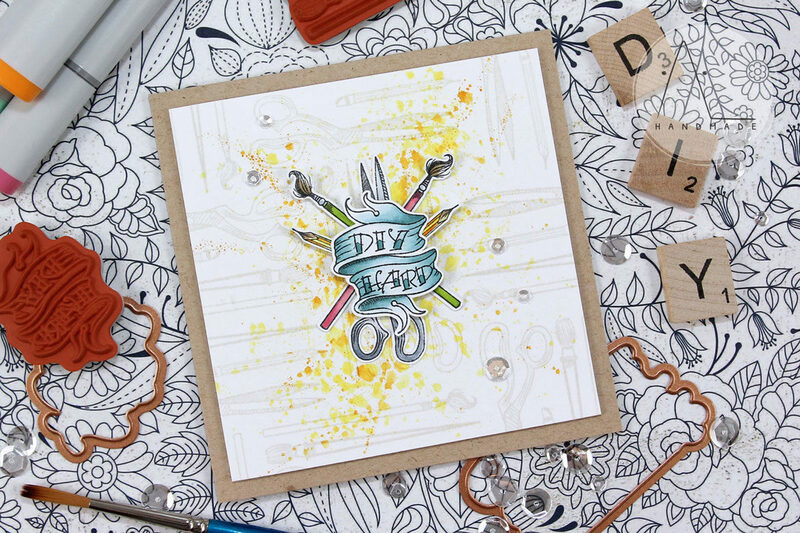 I stamped the craft tools several times on a white cardstock panel using Altenew Morning Frost Crisp Dye Ink. Then, I used the ink smooshing technique to add some yellow splatters on the stamped panel, using Wild Honey Distress ink diluted with water for a messy look. I stamped the main images with Memento Tuxedo black ink and colored them with Copics. I carefully fussy cut all of them and mounted them onto my card base, keeping the focus on the sentiment and creating a kind of crafty crest. I made some elements pop out using foam tape for dimension. Finally, I added a bit of shimmer on the sentiment using my Wink Of Stella clear brush and a bunch of sparkling clear sequins as embellishment. 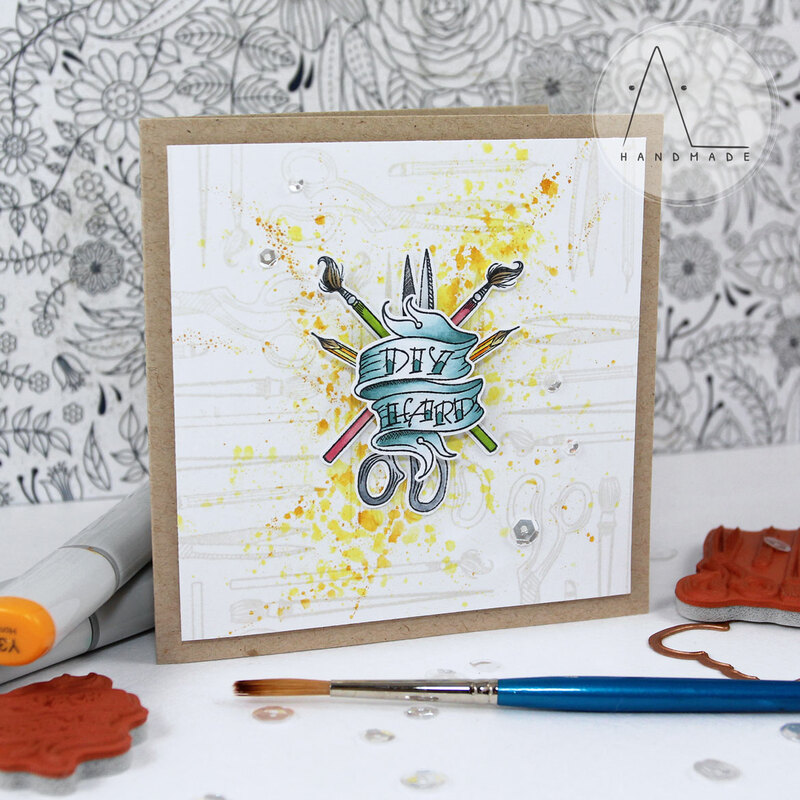 I just wanted to thank again Spellbinders for having me as a guest designer this month! Their products are just awesome! !